Millions of tourists head to Northern California's wine country every year. A little less crowded and a lot more laid-back than its Napa neighbor, Sonoma County supports 300 wineries, 40 spas and hundreds of gourmet restaurants. While many travel to the region to examine the "legs" of various vintages, one of the best ways to enjoy wine country is with your own two feet. One of Sonoma County's best-kept secrets is its vibrant running scene. Each day, before the winery-hoppers take to the streets, you'll find locals lacing their shoes in the morning fog. They head out on the 1,400 miles of secondary roads linking vineyards to the many different villages, or the 250 miles of forest, mountain and coastal trails spread among 45 regional parks. Follow the locals lead to experience the sportier side of Sonoma, while leaving your afternoons open for all the wine tastings, spa sessions, and fine dining your heart desires. Think of it as a vintner's perfect blend. An intimate luxury inn just a half block from the town plaza. bungalows313.com. The best full-service spa in Northern California. fairmont.com/sonoma. The birthplace of winemaking in California, dating back to Franciscan mission vineyards founded in 1823, the city of Sonoma is a hamlet by today's standards. Fewer than 10,000 people call this historic town home, and a good number of these residents belong to Murphy's Irish Pub Running Club. This local club meets the first Monday of every month, April through October, at its namesake pub (sonomapub.com) for a three-mile run through the vineyards and back to the pub for a pint. Guests are always welcome. Sebastiani (sebastiani.com) is the big-name winery in town. The family has been growing grapes and making wine in Sonoma for over a century. 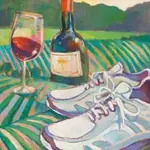 You can walk to their vineyard and tasting room, or you can run past it on a popular five-mile route that mixes trail and pavement. Starting at the town plaza, head north on 4th Street to Sebastiani and hang a right on Lovall Valley Road, running past the rows of vines. Turn left on Gehricke Road and run a half mile to Ravenswood Winery (ravenswoodwinery.com). Spin around and take Gehricke back down, turning right on Brazil Street to catch some new vineyard scenery on your way back into town. Another must-see winery just a few blocks off the town plaza is Bartholomew Park (bartpark.com), nestled at the base of the Mayacamas Mountain range. Founded in 1994, this 34-acre vineyard was certified organic in 2005. Its handmade, micro-lot premium wines are available exclusively through its tasting room and wine club. In the hills be behind the winery, three miles of marked trails open to the public (and their dogs) make for a rejuvenating run or hike. On a clear day, the view from Bartholomew Park's trails extends 30 miles to San Francisco, lending a sweeping panorama of Sonoma and its fertile valley.